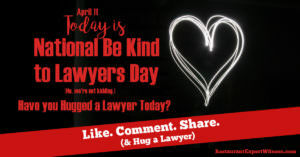 National Be Kind to Lawyers Day lands on the second Tuesday of April each year and Restaurant Expert Witness. Howard Cannon wants to take a moment to recognize the day and make you aware of the day. Also, wants to remind you to be kind to any lawyers that you meet today. At Restaurant Expert Witness, we speak with countless lawyers and have worked with them on more than 200 cases. The odds that you will encounter an attorney today are pretty high. Therefore, make sure that when you do, you remember to extend a little kindness their way. Have you hugged a lawyer today? If you are an attorney with a restaurant or bar matter, an expert witness could be the key to winning your case. Check out Restaurant OSHA Safety and Security, and visit Restaurant Expert Witness to learn more about Howard Cannon and his restaurant and bar expert witness services. If you are an attorney interested in reviewing a copy of Restaurant OSHA Safety and Security, please comment below or send us a message.